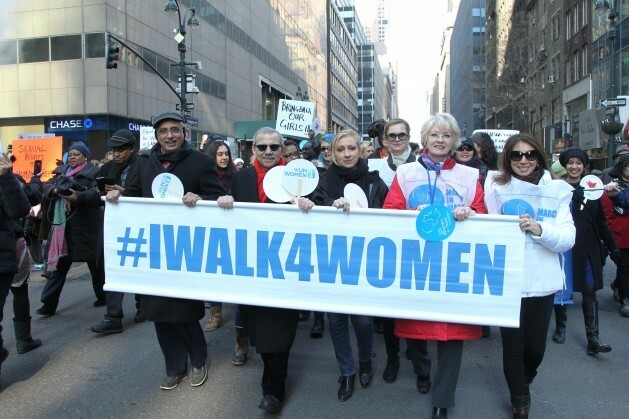 Participants in the 2015 New York March for Gender Equality and Women's Rights. Credit: UN Photo/Devra Berkowitz. NEW YORK, Jan 20 2017 (IPS) - Just one day after the inauguration of President-elect Donald Trump, hundreds of thousands of women are expected to attend one of the largest demonstrations in history for gender equality. Starting out as a social media post by a handful of concerned women, the Women’s March on Washington quickly transformed, amassing over 400 supporting organisations representing a range of issues including affordable and accessible healthcare, gender-based violence, and racial equality. “It’s a great show of strength and solidarity about how much women’s rights matter—and women’s rights don’t always take the front page headlines,” Nisha Varia, Advocacy Director of Human Rights Watch’s Women’s Rights Division told IPS. Despite the variety of agendas being put forth for the march, the underlying message is that women’s rights are human rights, Executive Director of Amnesty International USA Margaret Huang told IPS. “All people must be treated equally and with respect to their rights, no matter who is in positions of authority and who has been elected,” she said. Organisers and partners have stressed that the march is not anti-Trump, but rather is one that is concerned about the current and future state of women’s rights. “It’s not just about one President or one candidate, there’s a much bigger banner that we are marching for…our rights should not be subject to the whims of an election,” Kelly Baden, Center for Reproductive Rights’ Interim Senior Director of U.S. Policy and Advocacy told IPS. The health system also risks returning to a time when many insurance plans considered pregnancy a pre-existing condition, barring women from getting full or any coverage. “It’s about women, not Trump,” she continued. The rhetoric used during the election is among the concerns for marchers as it reflects a troubling future for women’s rights. During his campaign, President-elect Trump made a series of sexist remarks from calling Fox News host Megyn Kelly a “bimbo” to footage showing him boasting of sexual assault. Though Trump downplayed his remarks as “locker room talk,” his rhetoric is now being reflected in more practical terms through cabinet nominations. Huang pointed to nominee for Attorney-General Jeff Sessions who has a long and problematic record on women’s rights including voting against the reauthorisation of the Violence Against Women Act, rejecting anti-discrimination protections for lesbian, gay, bisexual and transgender (LGBT) people, and opposing the Lilly Ledbetter Fair Pay Act of 2009 which addresses pay discrimination. During her confirmation hearing, Nominee for Secretary of Education Betsy DeVos wouldn’t say if she would uphold title IX which requires universities to act on sexual assault on campuses. According to the National Sexual Violence Resource Center, one in five women and one in 16 men are sexually assaulted while in college. The new administration has also recently announced cuts to the Department of Justice’s Violence Against Women Grants, which distribute funds to organisations working to end sexual assault and domestic violence. “There is no question that we’re going to have some challenges in terms of increasing protections for women’s rights over the next few years,” said Huang to IPS. Meanwhile, Varia pointed to other hard fought gains that risk being overturned including the Affordable Care Act (ACA). The ACA, which U.S. Congress is currently working to repeal, provides health coverage to almost 20 million Americans by prohibiting insurers from denying insurance plans due to pre-existing conditions and by providing subsidies to low-income families to purchase coverage. If repealed, access to reproductive services such as contraception and even information will become limited. The health system also risks returning to a time when many insurance plans considered pregnancy a pre-existing condition, barring women from getting full or any coverage. “Denying women access to the types of insurers or availability of clinics that can help them get pre-natal checks and can help them control their fertility by having access to contraception—these are all the type of holistic care that needs to be made available,” Varia said. The U.S. is one of the few countries in the world where the number of women dying as a result of child birth is increasing, Varia noted. In Texas, maternal mortality rates jumped from 18.8 deaths per 100,000 live births in 2010 to 35.8 deaths in 2014, the majority of whom were Hispanic and African-American women. This constitutes the highest maternal mortality rate in the developed world, closer in numbers to Mexico and Egypt than Italy and Japan, according to World Bank statistics. A UN Working Group also expressed their dismay over restrictive health legislation, adding that the U.S. is falling behind international standards. Though the ACA repeal and potential defunding of Planned Parenthood, another key reproductive services provider, threatens all women, some communities are especially in danger. Francis Madi, a marcher and Long Island Regional Outreach Associate for the New York Immigration Coalition, told IPS that immigrant and undocumented immigrant women face additional barriers in accessing health care. Most state and federal forms of coverage such as the ACA prohibits providing government-subsidised insurance to anyone who cannot prove a legal immigration status. Even for those who can, insurance is still hard or too expensive to acquire, making programs like Planned Parenthood essential. “I can’t even do my job as an organiser asking for immigrant rights if I’m not able to access the services I need to live here,” Madi told IPS. Madi highlighted the opportunity the march brings in working together through a range of issues and identities. “I’m going because as a woman and an immigrant and an undocumented immigrant as well…it’s very important to attend this march to show we can work together on our issues,” she told IPS. “If we don’t organize with each other, we can’t really achieve true change,” she continued. In its policy platform, organisers of the Women’s March on Washington also stressed the importance of diversity, inclusion and intersectionality in women’s rights. “Our liberation is bound in each other’s,” they said. This includes not only women in the U.S., but across the world. “There’s definitely going to be an international voice in this, not just U.S. activists,” Huang told IPS. Marching alongside women in Washington D.C. on January 21st will be women in nearly 60 other countries participating in sister marches from Argentina to Saudi Arabia to Australia. “Women are concerned that a loss of a champion in the U.S. government will have significant impacts in other countries,” Huang said. Of particular concern is the reinstatement of the “global gag rule” which stipulates that foreign organisations receiving any U.S. family planning funding cannot provide information or perform abortions, even with funding from other sources. The U.S. does not fund these services itself. The policy not only restricts basic right to speech, but analysis shows that it has harmed the health of low-income women by limiting access to family planning services. The US Agency for International Development (USAID) is the world’s largest family planning bilateral donor. Though the march is important symbolic act of solidarity, it is just the first step. “We are also part of a bigger movement—we need to come together and be in solidarity on Saturday and then we need to keep doing the hard work [during[ the long days and months and years of organising that we have ahead of us,” Baden said.